Calls for comprehensive reforms in the World Bank are now widespread. Rich nations, emerging economies and poor nations are united in the quest for fundamental reforms in the structure and operations of the World Bank. Four critical issues that should constitute core, fundamental reform efforts in the World Bank are: a tight focus on the fight against global poverty; the need to better legitimize World Bank operations through transparent, equitable and representative governance structures; a simplification of the Bank's operations and an enhancement of technical resilience in responding to short-term global crises; and a more assertive World Bank leadership in ongoing efforts to reshape the international financial system. It is important to note that calls for reforms in the World Bank are not new. In the last decade, the World Bank has been the subject of multiple, high-level focused or ancillary reviews by eminent panels of experts, including the Zedillo Commission; the United Nations Stiglitz Report; the G-20 Working Group on the World Bank and other Multilateral Development Banks; the Spence Commission on Growth and Development Report; the Volcker Report on anticorruption programs of the World Bank; and the Meltzer Report that reviewed the World Bank and the International Monetary Fund (IMF) for the U.S. House of Representatives in 2000. The United Nations General Assembly in June 2009 hosted a conference on the global financial crisis, adopting a resolution on the way forward. All expert, independent reviews of the World Bank in the last decade agree that the Bank is relevant to global development efforts and that the organization will benefit from systematic restructuring of its operations. The World Bank has widely acknowledged strengths. These strengths include highly trained staff, deep institutional knowledge of target countries, the capacity to raise and deploy vast amounts of financial resources and success stories from its tightly focused programs. The World Bank has its own share of notable weaknesses, including diffidence in strategic intent and direction, an opaque decision-making process, and the perceived control of Bank's internal policies by selected wealthy nations. The Bank has also come under sustained criticisms from civil society organizations around the world, including huge public demonstrations against its policies in poor countries. 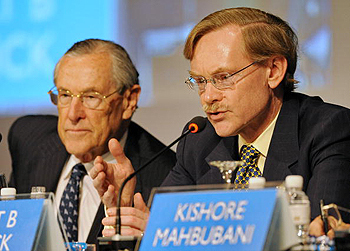 President of the World Bank Robert Zoellick is on record as being on board with institutional reforms. The president noted at the Bank's October 2009 Meeting in Istanbul that the institution is already reforming with focus "on improving development effectiveness, promoting accountability and good governance, and continuing to increase cost efficiency." What will be at stake within the next year when a comprehensive reform of the World Bank is likely to reach decisive stages is what specific issues will constitute the framework for reforms and in what sequence a reform package will be implemented. Reaffirmation of the World Bank's core mission of "making poverty history"
The mission of the World Bank, as noted on its website in October 2009, is "to fight poverty with passion and professionalism for lasting results … providing resources, sharing knowledge, building capacity and forging partnerships in the public and private sectors." Current and past leaders of the World Bank have discussed the role of the institution within the framework of "overcoming poverty," "making poverty history," and "fighting global poverty and helping the world's poor forge better lives." A logical question is whether the World Bank is tightly focused on "making poverty history" around the world? Reform efforts are likely to commence with a thorough reexamination of current strategies, policies and programs as it relates to its core mission of fighting global poverty. In addition, the reform effort should include a review of potential overlap of activities with its sister institution, the IMF. The IMF, according to its website in October 2009, "works to foster global growth and economic stability. It provides policy advice and financing to members in economic difficulties and also works with developing nations to help them achieve macroeconomic stability and reduce poverty." It is well known that the World Bank and IMF collaborate closely. What is not readily known is how strategies and programs of the two institutions intersect, are duplicative or frankly counterproductive in the fight against global poverty. World Bank and United Nations estimates indicate the number of people currently living under extreme poverty (less than $1.25 a day) to be between 1.2 and 1.4 billion. The G-20, in its 2009 Pittsburgh Statement, estimated that more than 4 billion "people remain undereducated, ill equipped with capital and technology, and insufficiently integrated into the global economy." It is also important to examine whether an inherent conflict of interest exists between how the World Bank finances its operations and its core mission of fighting global poverty. The World Bank raises money from interests accruing from loans made to needy nations and from contributions made by rich nations. In designing antipoverty projects, is the World Bank favoring countries that have the best chance of paying back loans? Can the board and senior management of the World Bank realistically disregard the opinion and interests of nations that contribute substantially to its coffers? Another critical reform question is how best to realign and redeploy the staff of the World Bank in a renewed fight against global poverty. In addition, what specific roles should Diaspora communities play in a renewed fight against poverty in their native countries? Recent World Bank publications show the critical importance of remittances from Diaspora communities to the national economies of emerging market countries and poor nations. Currently, there is a consensus on 47 percent representation of developing nations in the decision-making mechanisms of the World Bank by the spring 2010 meeting. The right thing to do is a 50-50 representation between developed and developing countries. The World Bank of the future will be stillborn without equitable, transparent and proportional voice and representation in all governance structures. In another major development, the next president of the World Bank is likely to be chosen after a transparent process that is open to qualified individuals from all nations. In addition to equitable voice and representation in the governance of the World Bank, reform efforts should include mechanisms that assure the participation of the poor and their stakeholders in the design, implementation, monitoring and evaluation of all operations. World Bank operations will become more legitimate if its internal and external actions reflect a deep understanding and sensitivity to the needs of the poor. A powerful way to demonstrate institutional concern for the poor is to redesign World Bank staff appraisals, incentives and rewards to give high weight to the participation of the poor and target populations in projects under control. The World Bank group is a composite of five institutions: the International Bank for Reconstruction and Development, the International Development Association (IDA), the International Finance Corporation, the Multilateral Investment Guarantee Agency and the International Center for the Settlement of Disputes. Each arm has its own governance structure and board of directors. The World Bank group is basically five institutions morphed into one giant institution. The complexity of the World Bank group is laid bare by the fact that same individuals, representing same constituencies, serve as members of different boards of directors of two or more organizational arms of the institution. It is not surprising that independent reviews of the World Bank have criticized the unwieldy structure of the institution. Calls for a nimble, agile, forward-looking World Bank will be difficult to achieve with the present composite structure. Discussions on reforms regarding the oversight functions of current governance structures (Bank Board of Governors, the Development Committee and the Executive Board) will depend heavily on final decisions made about the composite structure of the institution. Critics of the World Bank have renewed calls for review of the credits, loans and grants through which poor countries receive assistance. In fiscal year 2009, development grants accounted for 4.4 percent of World Bank approved funding. If the global financial crises lingers, the World Bank will come under renewed pressure to convert most of its assistance to the poorest nations through grants. The IDA arm of the Bank is the primary entity fighting global poverty. However, at least four organizational arms of the World Bank have functions that are relevant to national economic growth issues. During the Bank's October 2009 meeting, finance ministers from leading industrialized nations sounded a note of warning that the institution needs to demonstrate clear evidence of deep, sustained reforms in order to enjoy continued support from wealthy nations. During this meeting, some influential wealthy nations reportedly shunned the request of the World Bank leadership to replenish its resource base. The Bank had ramped up its lending assistance from $13.5 billion in 2008 to $33 billion in 2009. The rebuff sends a dire warning since the World Bank was reportedly asking for $3 billion to $5 billion to revert to pre-2009 levels in two years time. The Bank is reportedly planning to increase lending for infrastructure projects up to $15 billion a year for the next three years. Reform efforts should address how best the World Bank can operate on the ground in target countries. In Africa, for example, should infrastructure projects be the responsibility of the World Bank or the African Development Bank? The World Bank will also need to show evidence of close coordination of activities with other development agencies and stakeholders. The World Bank has received generally high marks for its response to the ongoing global financial crisis. According to the Bank's 2009 Annual Report, the institution tripled support to IBRD borrowers, with an increase of $100 billion through 2011, and has made available at least $42 billion in IDA resources up to 2011. The World Bank also approved an increase of $12 billion over a two-year period to support agriculture programs as part of a coordinated global anti-hunger response. The challenge for the World Bank in the short term is to beef up its technical competence in advising governments on how to proactively respond to an impending global crises, how to shield the poor and vulnerable populations from the harsh impact of global financial crises and how economic policy makers around the world can sharpen early warning systems that can detect potential financial meltdowns. Based on lessons learned from the current financial crisis, political leaders from rich nations, emerging economies and poor nations appear united on the need to create a transparent and equitable global financial architecture. This effort will rely heavily on shared technical expertise, coordination of activities across national borders and sustained political will across economic ideologies. The World Bank has the necessary skill set and deep knowledge of at least 186 countries to provide both technical and coordinating leadership to both the G-20 and U.N. General Assembly on revamping the global financial system. A more assertive World Bank leadership can also rub off on another pressing global issue: the need to make developmental assistance more effective. The 2005 Paris Declaration on Aid Effectiveness focused on how to better operationalize aid programs. The follow-up 2008 Accra Agenda for Action focused on national ownership, leadership and accountability issues. However, international aid programs need fundamental reforms in both donor and target countries. Restrictive conditionalities and narrow national development priorities are well-known problems in donor countries. Governance challenges, limited infrastructure support and poor program outcomes are important issues in target countries. The World Bank should coordinate aid reforms with other development agencies, the private sector and foundations. What can the World Bank and other development institutions learn from the success stories of telecommunication entrepreneurs that brought cell phones to the poorest parts of the world in a relatively short period of time? What can the World Bank and other development institutions learn from organizations such as Kiva.org that link wealthy individuals in mostly rich nations to budding entrepreneurs in poor nations simply through clicks of a computer mouse, with donors being able to see in real time the direct evidence of their dollars at work, thousands of miles away? G-20 political leaders, in concert with the United Nations General Assembly, should appoint an International World Bank Reform Panel to make recommendations on the mission, strategies, governance, management and operations of a World Bank better suited to the development needs of the 21st century. The Panel should have representatives from all regions of the world, with expertise in development, finance, economics, civil society, the law, operational management, organizational change issues, research and Diaspora communities. The Panel should work fairly quickly, utilizing the work of various independent reports in the last decade and taking into cognizance the massive changes that have occurred worldwide (political, economic and social) since the founding of the World Bank more than 60 years ago. The World Bank of the future needs clarity of purpose, clarity of mission, clarity of target populations, clarity of operations and clarity of expected program outcomes. The Zedillo Commission reached a stunning conclusion that in today's World Bank, there is no price to pay for failed bank policies, failed policy prescriptions in developing countries or in botched projects on the ground in poor countries. The World Bank should be a friend and beacon of hope to all families struggling to escape poverty. As an organization that has spent more than $400 billion fighting global poverty, the institution should be universally acknowledged as both sensitive and responsive to the needs of the poor. Muhammad Yunus, the Nobel laureate in economics who pioneered microfinancing for the poor, noted recently in a TIME magazine interview, "We can create a world without poverty. Poverty should belong to the museum." To achieve this noble goal, the World Bank reforms should be part of a coordinated global effort to make poverty history.